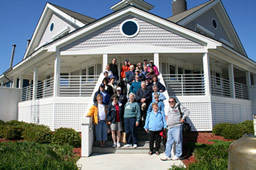 Chesapeake Chapter, US Lighthouse Society - The Trips, Meetings & Events - We're Having Fun Now ! We're Having Fun Now ! Click on the smaller images below to view a full-sized shot of us on some of our trips. As my husband Robert and I were driving to Southport, NC Thursday evening, April 27th in the rain, my mind was focused on the weather forecast that this system was going to move out during the night and we were to have dry days and sun for Friday, Saturday and Sunday. I was praying that the weatherman was right for a change. AND, he was, except for the wind, as I will digress later. 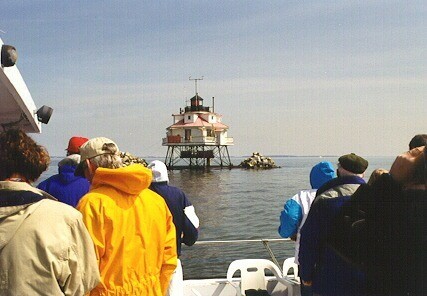 On Saturday, August 20, 36 Chapter members and guests boarded the fishing boat Brooks Hooks from the docks at Harrison's Country Inn and Sport Fishing Center, on Tilghman Island for an up close and, as it turned out, speedy visit to five water-based lighthouses on the (upper) middle portion of the Chesapeake Bay. After loading the boat with box lunches, several coolers filled with soda and water, many door prizes, a couple of Harbour Lights and a sample of the Chapter's store, we were underway at 9 AM. Photo not available July 16th was a typical July day in the Hampton Roads area, hot, hazy and humid. 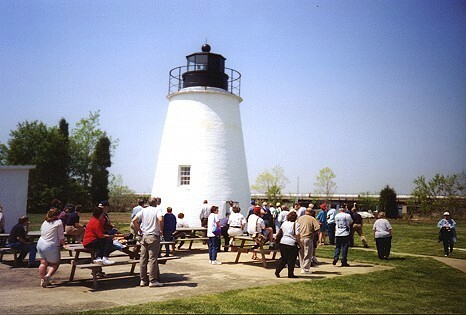 Twenty-three eager participants (our lighthouse lovers are always early; real, real early) were anxiously waiting for the bus to arrive in the Greenbrier area of Chesapeake, Virginia. 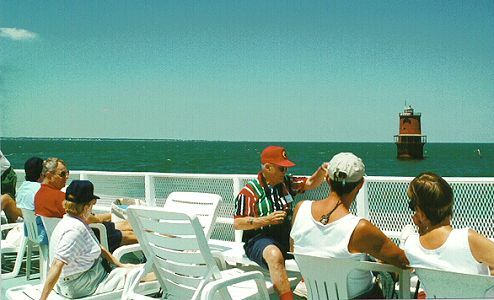 Once aboard, we were off, almost on time (the bus was a few minutes late), to our first destination, the National Aids to Navigation Museum at the USCG Training Center in Yorktown, Virginia. Photo not available There’s something about lighthouse enthusiasts–nothing can daunt their love of lighthouses! We had to get up early and meet at the Christiana Mall parking lot and car pool since we did not have enough participants to charter the bus we expected to use. We were met with terrible wind that day but the sun kept creeping through and gave us hope that it would get warmer. Photo not available May 10, 2003 was the date of our first trip of the season - The Craighills. The weather proved to be very "iffy" as everyone boarded in good spirits. Due to the extreme fog and pending severe afternoon thunderstorms Captain Wallace Thomas decided to speed up and get to Sandy Point Lighthouse first and then make our way back to Baltimore via the Craighill Range Lights. Along the way a super commentary was provided for us by our special guest, Mr. Walt Mathers, the great grandson of the last keeper of one of the Craighill lights! We embarked around 9 am, and our first stop was the Bloody Point Bar lighthouse. After circling for photos, we headed to Thomas Point Shoal, Sandy Point Shoal, and Baltimore Lights. We then headed across the Bay to Tolchester Beach for lunch. After lunch, we went north to Pooles Island; we circled the island, and then crossed the Bay again to view the four Craighill Channel Lights. After these lights we headed south to Sharps Island, our final lighthouse. Members were given the option of not going on the cruise, but everyone decided to brave the rough seas. Coast Guardsman Steve Allenbach decided to ride along as well, and we were glad to have him aboard. 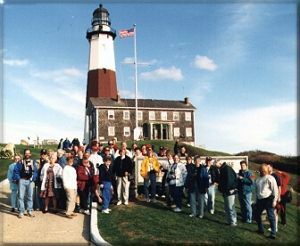 The Chesapeake Chapter US Lighthouse Society trip to visit and photograph Long Island Lighthouses took place from October 8-11, 1999. 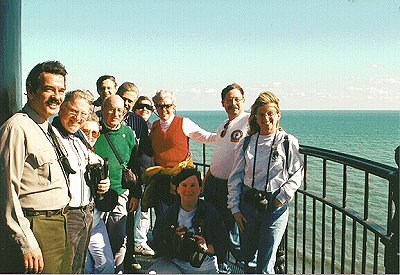 It was an exciting, fun filled 4 days for the 54 participants as we photographed 15 lighthouses and enjoyed the opportunity to get to know some of our fellow Chapter members a little better. 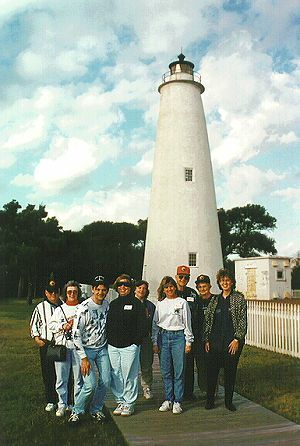 On October 30, 1998, The Chapter was privileged to be able to tour the Cape Charles lighthouse on Smith Island at the southern tip of Virginia's Eastern Shore. The Piney Point Lighthouse was built in 1836 by John Donohoo. The tower is 35 feet tall, much the same as Concord Point and Cove Point. 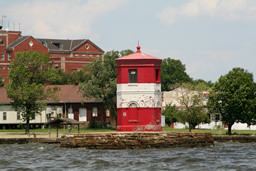 It stands about 14 miles up river from the Point Lookout light on the Potomac. We all enjoyed this trip very much ! Thanks Ruth ! A very calm and foggy cruise to Chesapeake Light Tower, 18 miles out in the Atlantic off Virginia Beach. 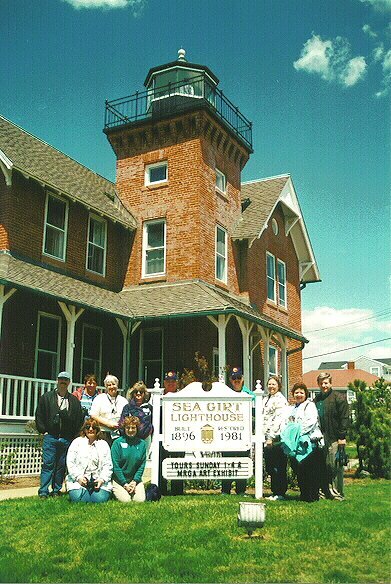 This lighthouse was constructed in 1883 at Drum Point, MD, about 2.1 miles east of it’s present position. 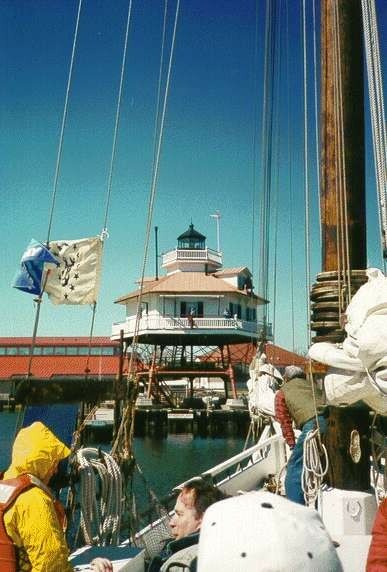 It was moved to the Calvert Marine Museum, Solomons, Maryland in March of 1975. A sunny day cruising by Hooper Island caisson lighthouse. Is that photograph crooked? 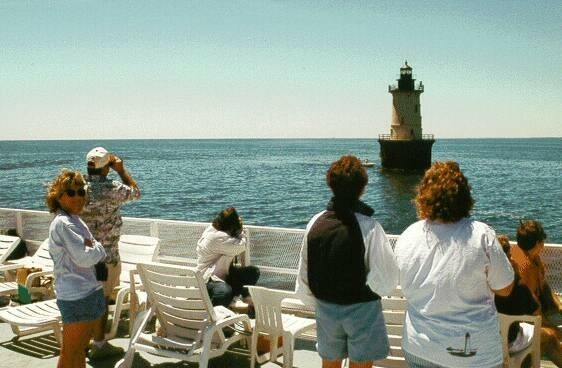 No...it's the lighthouse: Sharps Island lighthouse, which we cruised by on a skipjack in July 1997. 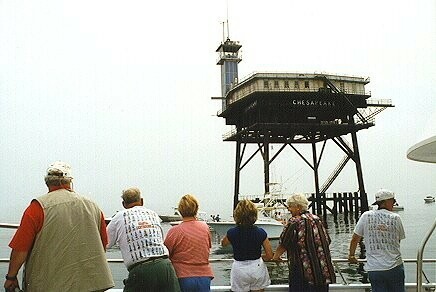 The Thomas Point Shoal Lighthouse is the last screwpile structure left on its original site in the bay. What a beautiful day it was ! 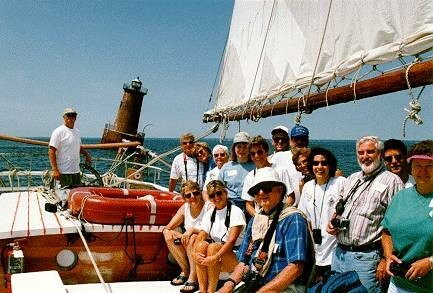 Captain Pete Brunk at the helm of his boat on our way back from docking at New Point Comfort lighthouse in June 1997. 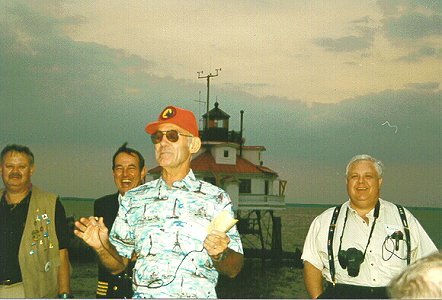 Pete Brunk tells a sea story during a sunset cruise to Thomas Point lighthouse, reminiscing about our late President, Herb Entwistle. 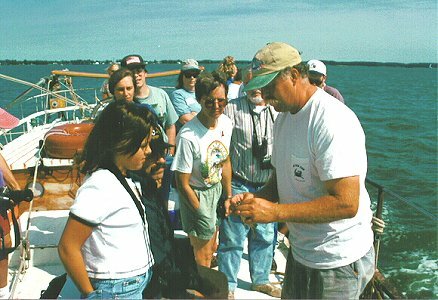 Captain Farley educates youngster Amanda Irwin about dredging oysters during a skipjack cruise to Sharps Island lighthouse. Visit the Heritage Page for pictures, history, directions and maps !